I became alarmed by this sudden increase in constipation and discomfort… also, my stool was FLAT ??? Then I finally put two and two together.. We went away for Thanksgiving and upon arrival back home I ran out of my T3 medication… I had to wait for an appointment to see the MD, the office staff wouldn’t call in my refill (I had complained since about this and the interruption of my medication due to their lack of willingness to give me 5 more days of meds…)… All together I am off the meds for 10 days and finally today my compounding pharmacy delivered my T3… I hope that in few days I will restore my intestinal motility and go #2 more easily… What an experience !!! The withdrawal caused me headaches, tiredness, dizziness, sudden increase in my anxiety… but I guess I underestimates its effect on my constipation… Lesson learnt ! Thanks for enlightening us with your experience and further positive actions! I’m a male 39 and was diagnosed recently with TSH levels in 300. Since I started levothyroxine and quit gluten experienced that my poop now is consistent and long, according to internet posts, it falls under next to perfect shape. Wonder if it’s due to levothyroxine or quiting gluten. My doctor has also put me on Omeraprazole, been taking for last few months but planning to stop it given any side effects of long term use. I think stopping acidity is good but worried about its long term use and especially at this age!! Any thoughts? Thank you, thank you , thank you!! My son and I are both constipated all the time!! I have been searching and this article brought it all together for me!! I always suspected I had a thyroid issue and have several of the symptoms. Thank you for writing! I’m 20 years old, just recently diagnosed with hypothyroidism. It all happened because I was sleeping 11hrs a day and napping on top of that even though I was on a VERY high dose of Wellbutrin for my depression. Is weight loss part of the symptoms? And thanks for the information! Hi Nina, Weight gain is the most common weight-related symptom of hypothyroidism but there are also people with hypothyroidism that have normal weight and others lose weight too quickly. It unfortunately affects us all differently. Wonderful to have you at Hypothyroid Mom. 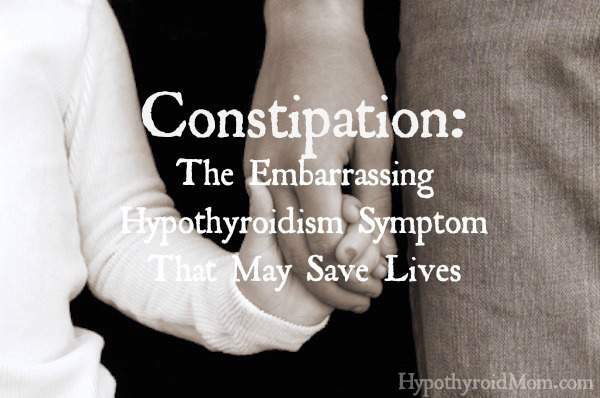 I’m a 67-year-old woman who has had Hypothyroidism since 1995. I was on Synthroid for several years, but I always had symptoms, but luckily I didn’t have constipation. I switched to NP Thyroid (I believe this is a version of Armour Thyroid but has less fillers). I was doing pretty well, and now since January of 2018 I could tell something was starting to get off kilter, so I wondered if my Thyroid was at fault. I saw my doctor and had my TSH tested, as well as my Free T-3 and Free T-4. My TSH was 3.67 so that explained the constipation. I feel best when the TSH is between 1.0 and 2.0. I’ve been on the new dose schedule that my doctor gave me for 11 days now, and I’m more constipated now than I have ever been in my life. My diet hasn’t changed from before, but now I am taking into account the types of foods I do eat. Miralax doesn’t even help me anymore. If this doesn’t improve by next week, I will be contacting my doctor again. I’m going crazy thinking I have colon cancer, but I have no other symptoms. I’m due for a colonoscopy in 2020, and my last one 8 years ago was fine. I’m thinking the extreme change of Thyroid medicine is causing this (new dose is 100 mg. more each week than previously). I, too, was always uncomfortable talking with my female doctor about my constipation. At this age, I don’t care anymore. If someone else is experiencing this from an increased dosage of Thyroid medication, keep track, and if it doesn’t improve, contact your doctor again and keep on the doctor until it is rectified. Thanks so much for your article. I too have an underactive thyroid. I have been on synthroid for about 30 years. Recently, I rejoined Weight Watchers and added dairy, nonfat yogurt, because it was free on the diet. That was a big mistake. I have ditched the dairy. I also stopped eating oats for breakfast. That was another big mistake. I need the morning fiber. I am so glad I found your article. Everything you have said is right on point. I too take my take my thyroid medication early in the morning on an empty stomach and wait an hour. Several times, since rejoining WW I didn’t do that and that was another big mistake. I have also realized I needed to add magnesium to my daily routine. Finally I stopped using olive oil for the diet and that was another big mistake. We need good fats in our diet. I will follow your suggestion about coconut oil. Thank you so much. I have lost twenty pounds, but now I need to lose wight the thyroid way.